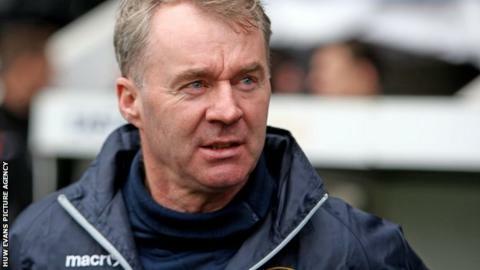 Newport County boss John Sheridan says he will be in charge beyond their FA Cup tie with Blackburn, despite reports linking him with the Notts County job. Bookies have tipped Sheridan, 51, to manage Notts, who parted company with Dutchman Ricardo Moniz last month. "I am flattered others clubs are interested in me, but it's just paper talk at the moment," Sheridan said. Meanwhile Newport have signed Preston North End's Ben Davies and Crystal Palace's Connor Dymond on loan deals. Defender Davies, 20, had a spell on loan at Southport earlier this season, making eight National League appearances for the Merseyside club. Palace midfielder Dymond, 21, has also joined the Exiles on loan until 13 February. Davies and Dymond are eligible for Saturday's visit of Blackburn, subject to international clearance. But Newport will be without Lenell John-Lewis, who is set to be sidelined for six weeks with a hamstring injury. The 26-year-old striker suffered a recurrence of a hamstring injury in training this week. The links with Notts County have been a backdrop to Newport's preparations for the cup tie but the club has re-affirmed they have had no approach for Sheridan. The former Chesterfield and Plymouth boss insisted the reports were "just hearsay" on 31 December. "I think everybody knows what my position is here," the former Republic of Ireland international added. "I can say I'm here for Blackburn, York, Dagenham, Orient - the next four, five, six games. Nothing is happening. "I have come to the club to try and keep (Newport) in the League. "While I am here I will give 150% to the job. That starts with the game on Saturday."